I have to say this up front: A majority of you are not taking advantage of your membership and are making critical mistakes. Luckily for you, these can be fixed easily within a few minutes, which I’ll highlight in this blog post. So, if anything, scan this blog post. I also have to say that I believe each one of you should sit down for at least 30 minutes, read this email, then take the necessary steps to get the entire benefit of the membership. By not doing so, you’re foregoing thousands of dollars in business, if not more. Taking a little time here can radically change what’s generated from this channel of your business. Without the membership and the 20+ advantages that come with it, I was about to generate over $526k from a single year’s worth of health fairs when I exhibited on behalf of a sleep center before co-founding HFC. Blog Post Link: Could $526k in revenue be generated from a $349 HFC Charter Membership? Ensuring that you’re taking advantage of your charter membership is essentially the low hanging fruit for you and the organization you represent. Buy purchasing it, being slightly active on HFC, and participating in health fairs - you’re 80% of the way there. In this blog post, I’m going to list the top 10 tactics charter members aren’t capitalizing on, starting with the tactics that will provide the most impact for you right away. The charter membership gives you an open channel of communication with health fair organizers (HR managers, benefits professionals, brokers and insurance carriers). Sadly, a little over 15% of members are taking advantage of this as of the writing of this blog post. Did you know you can communicate with health fair organizers before being accepted into their health fairs? For those of you who know this is an option, do you know how to do this - meaning, message the organizers right after applying? HFC lets you know which events you are approved for, which events you can complete your registration for, which events are pending (meaning, the organizer has yet to make a decision whether you’re accepted or denied), and which events you’re denied for. HFC also provides you an events tab where you can locate upcoming and past health fairs you were associated with. 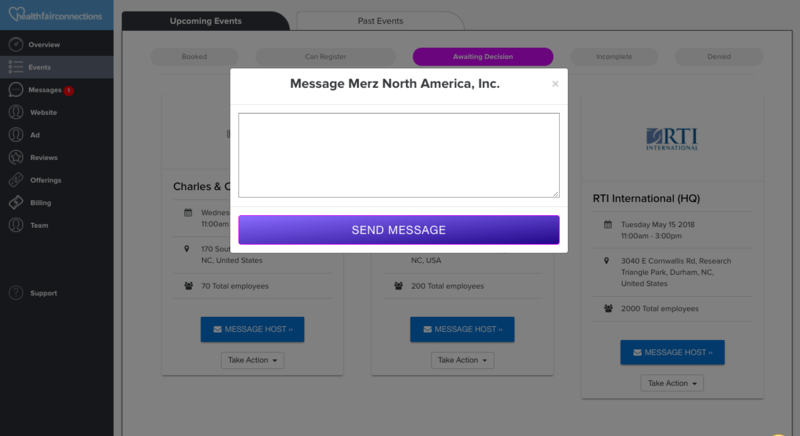 This is where you can see all the events that have the message option available. “What is the exact medical insurance policy for your company? How many employees plan on attending your health fair(s)? Can you feel out the attachment I provided with my health fair ad? Can you let me know by X date if I’m accepted or not? Once you send a message, you’ll be able to follow that communication chain via your messages tab. 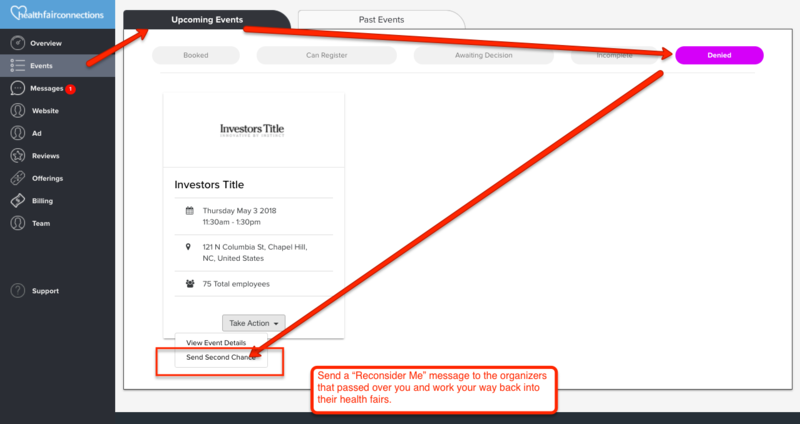 Messages sent to you by organizers will also tie into your email, and now HFC has allowed you to directly reply to your emails vs going back into your messages section to respond to the organizer’s message. Once they respond back, you’ll be able to attach a file and you’ll see this message in your messages section. HFC is actually re-working this messaging feature so that right when you apply, you’re shown the option to message right away, vs having to navigate to it inside your dashboard. Remember, in these messages, always air on the side of being nice and understanding, not pushy. I feel it’s necessary to say this because a few times when I haven’t, exhibitors were perceived as pushy by organizers and exhibitors didn’t get optimal results. Several charter members have been upset when they’ve been denied for health fairs. 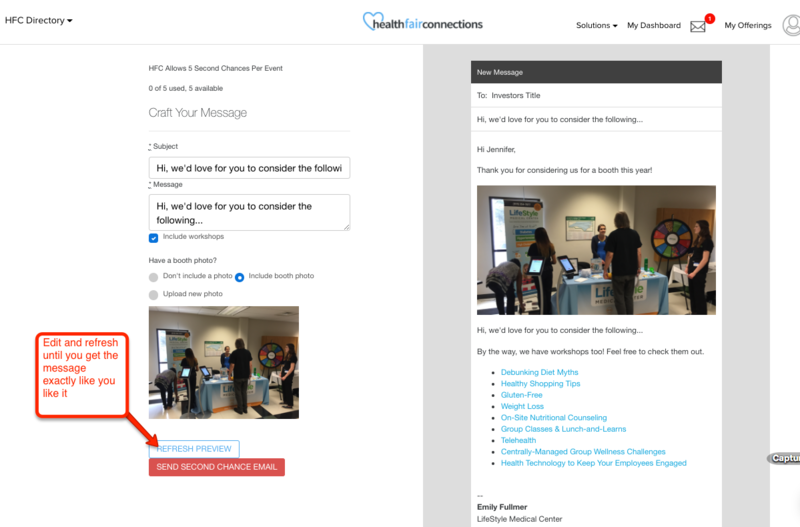 After reviewing their health fair application (ad) and noticing some glaring shortcomings, then the fact that they didn’t use a second-chance message (aka reconsider-me message), most have understood why they were denied. It’s been stated that the charter membership doesn’t guarantee health fairs, but that it does significantly increase your chances of being accepted. Using HFC’s second-chance message (aka reconsider-me message) is one way to increase your chances of selection if you’re ever denied. This means you can send a message that can lead to you being accepted into the health fair which you’re denied for. I’ll go into more as to why they get denied in the next section as I hinted at above, but I first want to let you know it’s not the be-all-end-all if you’re denied. Again, HFC gives you a second-chance message for each health fair. 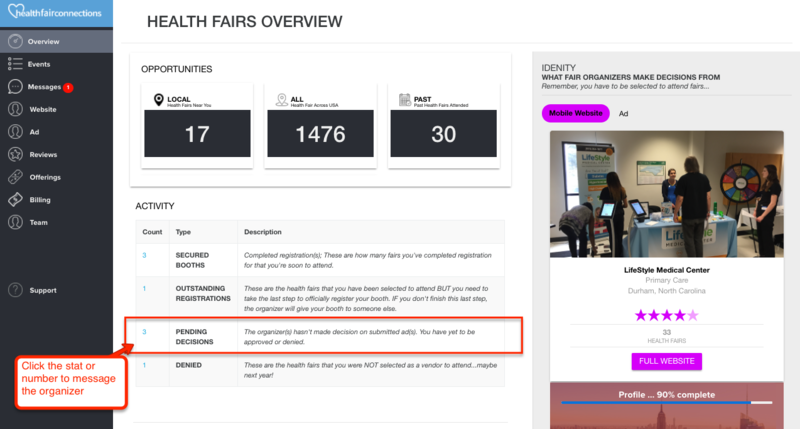 Outside of your health fair application, to give you a better idea of why you’ve been denied and to gain an understanding of what you can use to work your way back into the health fair(s) you’ve been denied for, look at the reason the organizer gave as to why you were denied for their health fair. If that doesn’t give you enough details, look at the interested list, as well as the registered list to get a better picture of what exactly is going on. The two lists on the health fair listing will give you an idea if a competitor beat you to the spot or something to that nature. It will also let you know if the organizer didn’t accept any exhibitors or only a few. So, after gathering info as to why you may have been denied, send your second chance, aka reconsider-me message. If you send the message and you get in, which is very likely, complete your registration. You’ll receive an email to do so and you can also tell by checking out your dashboard. Also, feel free to reply and thank the organizer. If the organizer still says no or doesn’t respond after a period of time, kindly accept the fact you will not be attending. Recommend they have another health fair in fall or spring. As you know, HFC is different than other health fair companies. Exhibitors have to apply, then it’s up to the organizers to accept or deny exhibitors. 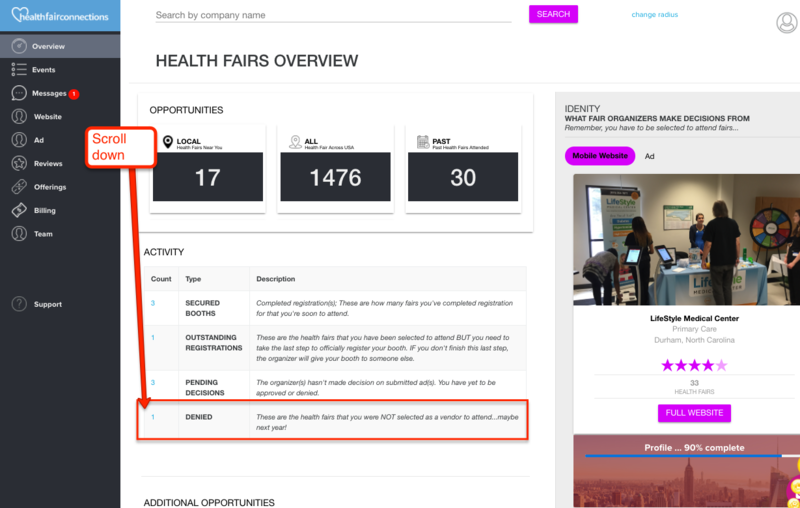 Exhibitors don’t buy booth spaces and HFC doesn’t accept/approve exhibitors to attend health fairs - that’s up to the health fair organizers (HR managers, benefits brokers, carriers, and etc.). HFC is an introductory platform. With that said, your health fair application (ad) is everything. Your application (ad) is what the organizer views and bases their decision on. Your ad is used to determine if organizers should accept, message, or deny you for their health fairs. If you don’t have a strong application, chances are you’ll be denied. The single most important element is your health fair booth photo! Shame on you if you have a logo or a headshot in the place of a booth photo and you’re complaining about being denied. Shame shame. Not having a booth photo is a critical mistake. A simple booth photo answers a lot of questions for organizers and is to your advantage. If an organizer so happens to select you, it will cause them a good amount of stress until they’re able to see you at their health fair because they can’t see what to expect from your booth. You don’t want to cause organizers to lose sleep at night, worrying about if they should have accepted you or not, do you? EVEN IF you represent a big named company and think it’s okay to forgo not having a booth photo, the HR manager wants to know if you’re just sending the front office staff to sit and text on their phone OR if you are sending a friendly, engaging, and interactive representative to engage their employees. Health fairs are big events and milestones for organizers throughout the year. Don’t add extra stress for them. Have a good booth photo on your health fair application. Plus, scroll through the exhibitor directory to see more: HFC’s Exhibitor Directory. HR managers are selecting exhibitors mainly on what they’ll look like at their health fairs. Secondly, they are looking at the exhibitor’s interactive offering and if they sound like they’re going to be an engaging and interactive exhibitor. Before you lay that big ole excuse on HFC :) I want to let you know that even financial planners and life insurance exhibitors can have interactive offerings. One legit concern is space, but as long as you have it, they should be able to accommodate you. If not, they’ll know you bought it and came “as advertised”. In regards to the raffle prize, it’s especially important for exhibitors that aren’t health and fitness related exhibitors (i.e. Edward Jones or Liberty Mutual) to overdeliver on this end. Did you know you that with the membership, you can invite two additional team members to your HFC account and vendor team? Did you also know for the folks you invite, that they can also have the charter membership capabilities? We found that unless we personally reach out to charter members, they aren’t inviting team members to share the benefits with them. Copy and past their emails in, then click "Invite". Once you click invite, they’ll receive an email to click a link to join your team. [temporary] If a team member currently doesn’t have a free account on HFC, you’ll have to ask them to take 30 seconds to create a free account before you’re able to invite them. Soon, you’ll be able to invite them whether they have an account or not. To elaborate on the manager role, you'll be able to log into each of your team members accounts and see what the status is for their events (pending, complete registration, denied, registered, etc.) OR simply just see the events they're attending. This is just the tip of the iceberg of what you can do with team functionality, as HFC will be adding more team functionality soon. The red bar at the bottom indicates who you've logged in as. Most charter members don't realize they have a goldmine of value sitting at the bottom of their health fairs overview page until I let them know. Literally, hot opportunities and leads sitting there that could be reached out to right away. 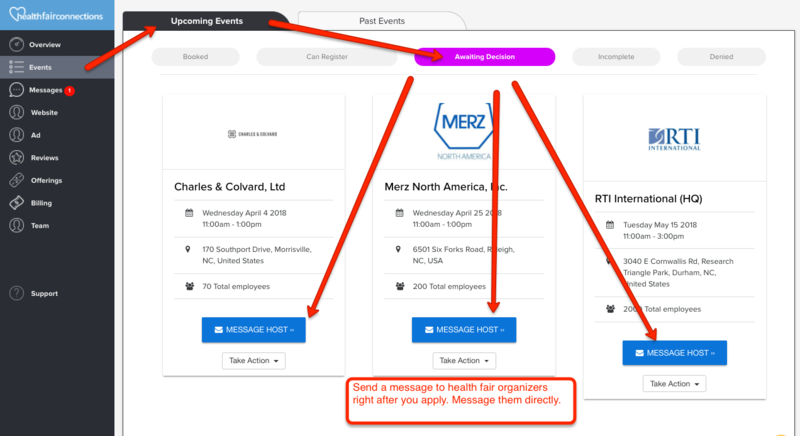 Within seconds, you could message a health fair organizer (HR managers, brokers, carriers) to say thank you for letting us attend and/or to set up a meeting with them. It’s like saying you want to land a meeting and want the business that’s directly in front of you and doing NOTHING about it. And, we know you do want to do something about it, you just didn’t know it was there. The follow-up message allows you to really build yourself up and to gain more relationships with corporations and their employees. This is the same template HFC uses for its second chance emails. HFC allows you to swap out photos and edit the message until you get it just like you like it. You can refresh after each edit until the message looks the way you want it to. Follow-up with past health fair organizers today. Many exhibitors offer corporations some sort of offering(s) outside of these corporations’ annual health fairs. Don’t have anything to offer corporations? I’m sure you can do a presentation to employees, right? Once you list your offerings, they’ll show up on your one-page corporate wellness website and be listed on your vendor or exhibitor directory listings for health fair organizers, HR managers, insurance carriers, and benefits reps to see. HFC now has enabled organizers to contact exhibitors directly through their workshop listing but this is only for HFC Charter Members. HFC allows organizers to leave ratings and reviews for exhibitors that have attended their health fairs. HFC sends organizers two messages after the health fair asking them to do so. 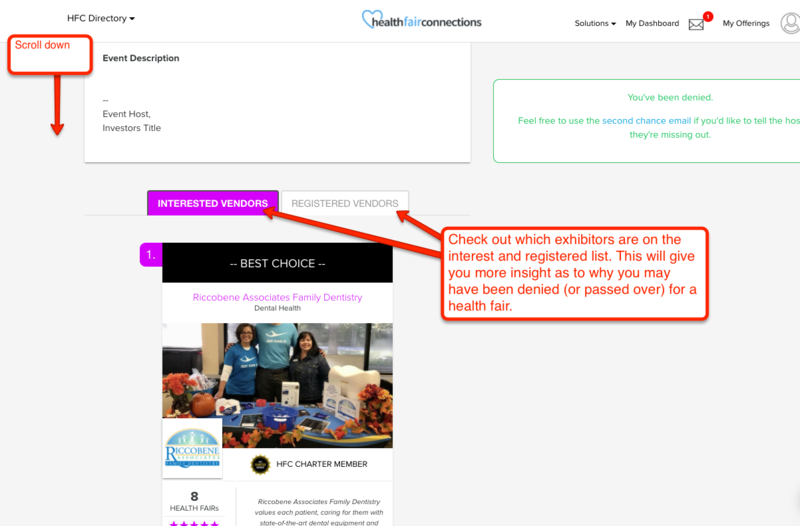 If an exhibitor doesn’t receive a rating and review from a health fair organizer, HFC allows exhibitors the ability to reach out and request one via HFC. Charter members can do this for free. The better your ratings and reviews, the higher chances you’ll be accepted into health fairs. If you have a low average star rating, chances are, you won’t be accepted into many health fairs without putting in work (messaging right away, second chance message, etc.). 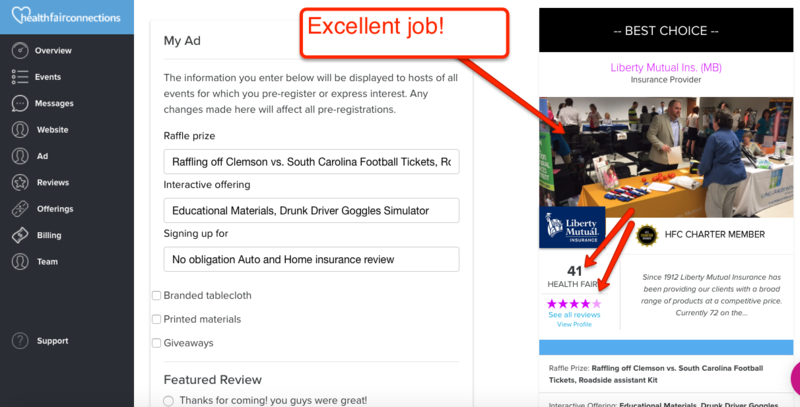 As you can see above, in addition to the ratings, organizers are able to leave exhibitors reviews and can add additional information here. For exhibitors who don’t like the rating or reviews they receive, or say they’d like to add more details to what they organizer has said, they can publicly reply to their ratings and reviews. Charter members can publicly reply or respond to ratings and reviews left by organizers at no extra cost. Charter members have this luxury. If you’ve received ratings and reviews from health fair organizers, this is your chance to reply to give the full story. This is your chance. Let those who view your website know the full story. Do you know HR managers essentially live on LinkedIn? Did you know HR managers and benefits professionals normally organize health fairs at those large corporations you’d like to get into? Did you know you can share your one-page, corporate wellness website on LinkedIn and do so directly from your website? Well - yes, yes, and you can! Lol. If there are any companies you'd like to break into that you haven't seen come through HFC, feel free to share your one-page website with them on LinkedIn. Don’t see any health fairs in your area? Sharing your website on LinkedIn is a perfect option for you. Again, you can share your one-page corporate wellness website directly from the button on your website. All you have to do is click the share LinkedIn button. 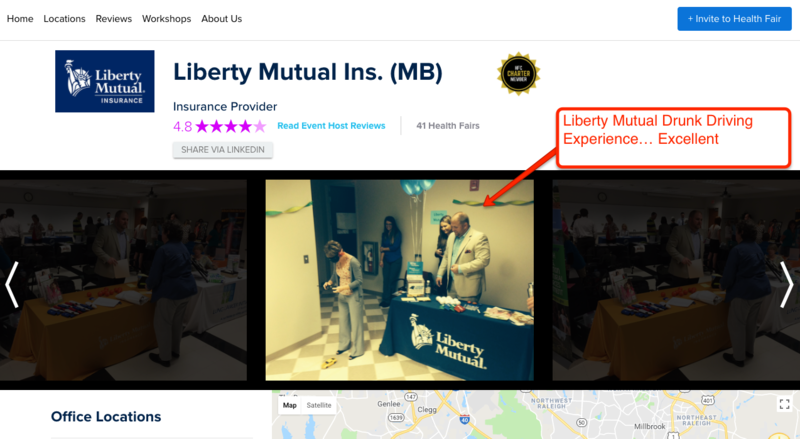 You'll be able to let health fair organizers know what you have going on in regards to your health fair presence and corporate wellness offerings in a template that has been proven to resonate with them. Sharing your one-page website will get the conversation started with health fair organizers. You'll ALSO show them the best health fair planning tool and resource for them. They'll thank you for sharing many times over in the end and they'll remember you for doing so. Not only that, the more companies that are brought on, the more they’ll share with their colleges, which means more opportunities for you! So, it’s to your benefit to share. Once you share with individuals, feel free to share with the masses. Charter members get stand-alone value with their membership and something that works for them around the clock! With the membership, the standard, free exhibitor profile is upgraded to a search engine optimized (SEO’d), one-page corporate wellness website. 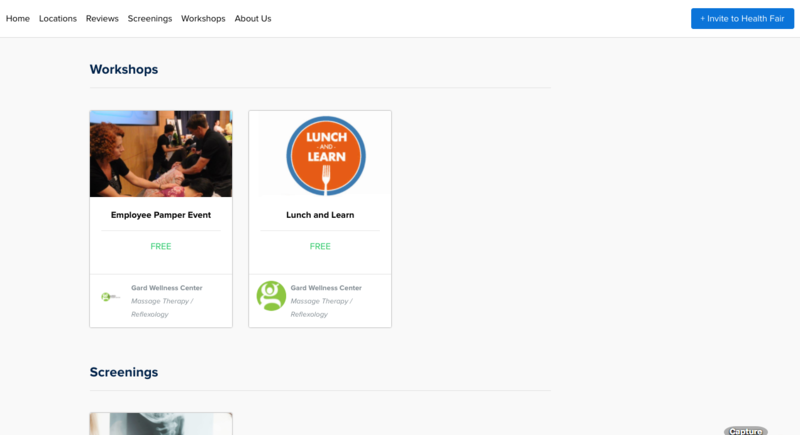 The one-page website allows exhibitors to showcase their corporate wellness and/or benefits portfolio to health fair organizers, HR managers, and folks at corporations looking to connect with resources in the community. There are times where health fair organizers and HR managers will look at your website to gather more information on whether they should accept, message, or deny you for their health fair(s). The website allows organizers to quickly find exactly what they’re looking for with the new nav bar that comes along with the site. I mentioned search engine optimization (SEO) in the beginning of this section, so I want to take a sec to let you know how your website is optimized for the search engines (ie. Google). HFC allows you to provide the following, via the new SEO icon on the edit website bar. All of these elements, plus more, are optimized, so you can be picked up by the search engines and found in the search results. Cool? Help them find you by showing up on the first page of results when someone searches for workshops, lunch ’n’ learns, or health fair exhibitors in your area. Your membership comes with advanced search features. You’re able to view upcoming, as well as past health fairs. Most exhibitors don’t realize they can search for past health fairs. 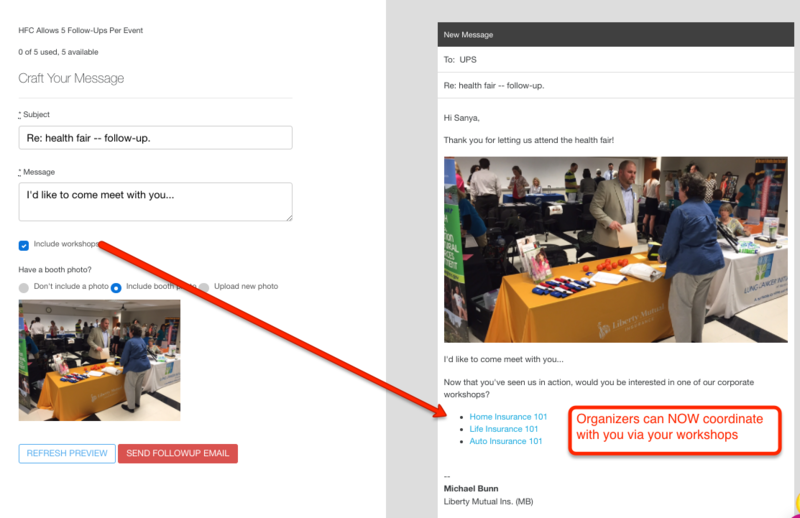 When viewing past health fairs, each past health fair has a button that allows you to view survey results when you click it. Avoiding poorly attended health fairs can actually save you money. So, know you’ll know which ones to avoid when they roll around again. Next, attach a value to each. With that said, even if health fairs bad, you can still gain from the opportunity (by networking with other exhibitors or the organizer), plus you can do computer work at your table if you experience one with little traffic. I mention this to clarify it’s not all black and white, so use sound judgment when determining which health fairs to avoid. Take advantage of your charter membership. Taking as little as 15-45 minutes and putting in a tiny bit more effort will lead to a significant spike in the return on investment (ROI) you receive from this channel of business. If you have any questions or would like more info, feel free to email me at squad[at]healthfairconnections[dot]com with the subject, Attn. : Kyle W. - questions about my charter membership.